Wow it was cold as everyone started showing up for the first Wine Country Flyers fun fly of 2014! There was also a five mile an hour head wind that added a extra chilling effect. We had ten pilots sign up to compete by ten o'clock. The first event "The dice roll" had a interesting element of chance built in to it. Steve lucked out and rolled a one. That indicated the amount of loops Steve had to perform then land. With a low time of 15.6 seconds he won sixteen dollars. Adam came in second with a time of 16.22 seconds. Julio, third with 18.8 seconds. 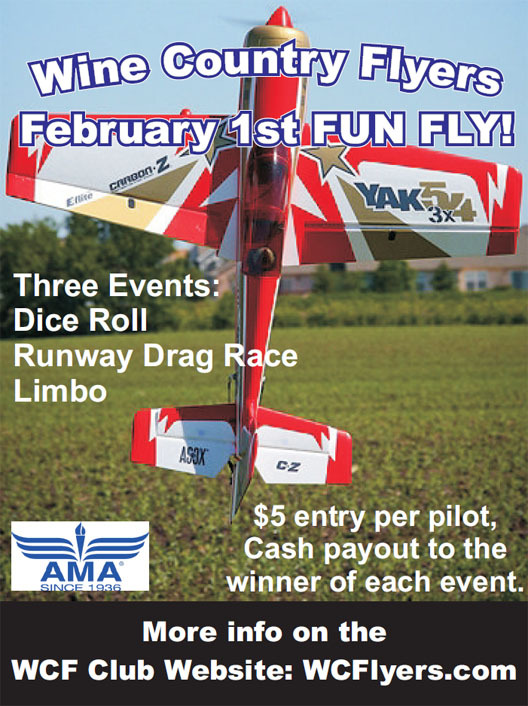 The second event was the "Taxiway drag race". The object was to start at the designated area then to taxi as fast as you could and pop a balloon tethered to the runway at ground level. Simple right? Half of the pilots did not finish. Then came Wylie and he made it look simple with a time of 5.9 seconds he won the sixteen dollar pot for the event. Adam came in a close second with a time of 6.8 seconds. Jacob, third with 10.0 seconds. The final event of the day was "Limbo". This was our only judged event in the contest. Charles McDonald and myself made it clear to all the contestants that we were looking to be impressed with style, flair, and a element of danger. Special consideration would given for a inverted or knife edge pass. Three pilots opted to try the inverted pass. Only Jacob pulled it off but was to high to win it. Jacob ended up one point behind the eventual winner. Our winner decided to climb to thirty thousand feet upwind. Then put it in a speed dive heading downhill and downwind and at the last second skimming inches off the runway under the pole with authority. It had all the elements we asked for. Style, who would have thought of heading upwind and speed diving downwind! Flair, the last minute skimming inches off the runway. Danger, threading the needle in between and under the poles! Congratulations Doug! Don't spend all the sixteen dollars at the taco truck. I can see that all those strafing passes paid off! Bill Walters came in third only four points behind the leader and three points behind Jacob. Not bad Bill for your first fun fly. It is with great sadness that we have learned that Charlie Cox passed on Friday, December 20, 2013. I have since learned that Charlie had a heart condition for the past 20 years and that is what took him. Charlie and his wife, Dorothy, were at the Christmas Party just two weeks ago having a great time together and now, suddenly, he is gone. 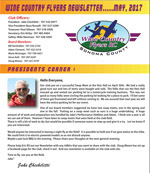 Charlie was an old school modeler and flyer with one of the lowest AMA numbers in Wine Country Flyers. Charlie once showed me a picture of him and his son performing a controline combat demo in Candlestick Park back in the sixties. Charlie was an active member of WAM (Western Area Modelers), I think he told me that he had some national awards for control line combat. He was that good. When we moved our field to Trentadue in 2008 Charlie was there with his backhoe tractor helping us move and place the Astro Turf runway. He was just a “can do” kind of guy that you could count on to help when we needed it. Charlie had nitro in his blood and loved 2 cycle motors but he also had experience with DynaJet motors and brought one to a meeting for “Show and Tell” recently where most guys had never heard of them. On the subject of electric flight, Charlie commented that, “I like to HEAR my airplanes”. OK, I understand that. Charlie was a traditionalist modeler for sure. I can’t remember many meetings that Charlie wasn’t there, usually with his good buddy Bill Van Asdlan and more recently chowing down on pizza at Round Table. We were all “Modeling Buddies” to Charlie and we’ll all miss him that’s for sure. A service to celebrate Charlie's life will be held Saturday January 11th, 1pm to 4pm in the Finley Community Center, Santa Rosa. WCF member emeritus Red Jensen has another global hit with the Invictus EF-1 racer from Hobby King. Invictus is one of several EF-1 designs by Red and this Hobby King manufactured rendition looks clean and fast! It's an ideal machine for the 2014 WCF EF-1 racing season, find all the details on 2014 Pylon racing on the forum pages.